Just before I headed home for spring break, Mom and Dad decided that Dad and I should go to Florida: STS-119 was supposed to launch on Wednesday night, and there's only a year's worth of shuttle launches left before we never get a chance to see one. We decided to fly down Wednesday morning, and back up Thursday afternoon, and stay overnight at my grandfather's house, in Fellsmere. Our flight out was at 6 AM, so we had to get up at 4 and head on over to BTV; the security people were irritating as usual, and decided to pat me down in order to find my entirely non-metallic wallet (or is it? duct tape? I don't know... Dad got through with his without any trouble). The flight was mostly uneventful; my ears aren't horribly happy with me, with the pressure changes while I'm coming off a little cold... We had a layover in JFK for an hour, and then the remainder of the flight. Again, uneventful. 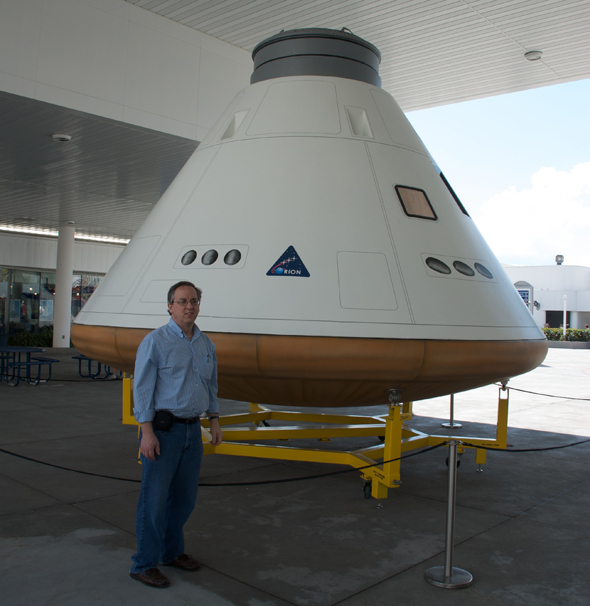 That's Dad in front of the next-generation Orion capsule (part of the Constellation program that's replacing the Shuttles). There are lots of other cool pictures of stuff over on Flickr, including a picture of Discovery's fuel tank peeking over the scaffolding out on the pad, which was, unfortunately, all we could see. All in all it was a fun trip — an adventure off in Florida with Dad, and I got to visit Pepa's new house in Florida, and hang out with him and Bernice for the evening. Battlestar Galactica: everyone at school has been raving about it and watching it, Reddit is obsessed, the Internet is up in arms, and I hadn't watched any of it up until recently. During the past week, I've run through the whole first season, and most of the second, and I have to say: if you haven't been watching it, you must. It's not a TV show, or a movie, or a book. It's a story, and it's amazing. Jayne mk. II is up and running. I decided not to change the name because coming up with a new name is really hard, and because it shares so many parts with the original Jayne that it really doesn't deserve a new name. All is going well, and I've not yet had any more temperature/power/whatever problems. Awesome! Nice story, thanks for sharing. I can't believe you'd never seen BG! Hope to see you Saturday....!